“Man on a Drinking Horse” A Print by Thomas Butts, Jr.
G. E. Bentley, Jr., writes about Blake’s life and his books. 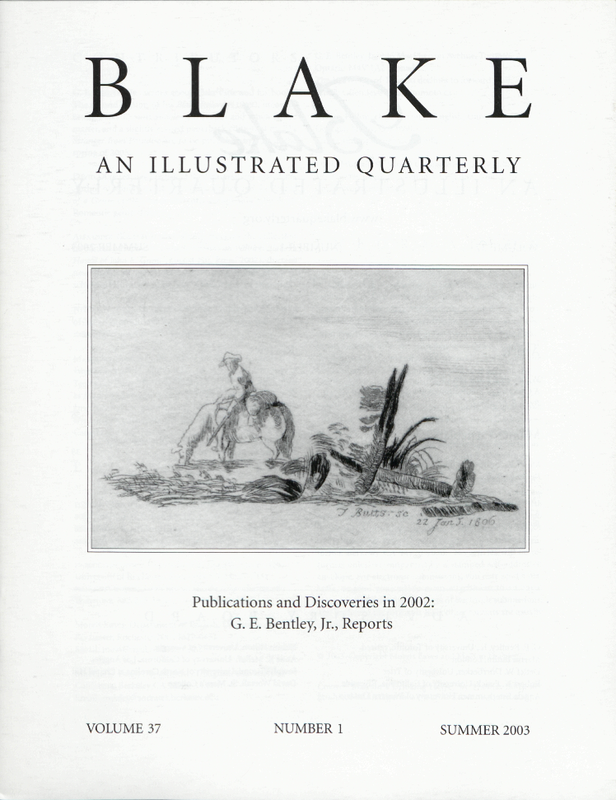 The second edition of his Blake Records (1969), incorporating Blake Records Supplement (1988) and much added matter, and a slightly revised paperback edition of his The Stranger from Paradise are to be published by Yale in the spring of 2003. David Duff teaches English at the University of Aberdeen. Author of Romance and Revolution: Shelley and the Politics of a Genre (1994), he is currently completing a book on Romantic genre theory. Alexander Gourlay is shamelessly plugging the collection he edited—Prophetic Character: Essays on William Blake in Honor of John E. Grant (Locust Hill Press, 2002), thirteen new studies of the art and poetry by a diverse group of scholars. He teaches at Rhode Island School of Design. Nelson Hilton appears as co-author with Jonathan Arnold of “Revelations from a bread mould,” a “News and Views” item in Nature, vol. 422 (24 April 2003). Margaret Storch is the author of Sons and Adversaries: Women in William Blake and D. H. Lawrence (University of Tennessee Press, 1990). She has published in journals such as Modern Language Quarterly, American Imago and D. H. Lawrence Review, and regularly contributes reviews to Modern Language Review. She has taught English in Britain, Canada and the United States. G. E. Bentley, Jr., 246 MacPherson Avenue, Toronto, Ontario M4V 1A2 Canada The University of Toronto declines to forward mail. Cover: “Man on a Drinking Horse,” by Thomas Butts. Reproduced by kind permission of Alexander S. Gourlay.